With Baselworld officially starting tomorrow, Hublot reveals the Big Bang Sang Bleu II created in collaboration with famed tattoo artist Maxime Plescia-Büchi, founder of Sang Bleu. This marks the second venture between the two, but this version not only offers Buchi’s design on the dial , but also features the creative concept in angular glory over onto the case and crystal for incredible three–dimensional appeal. 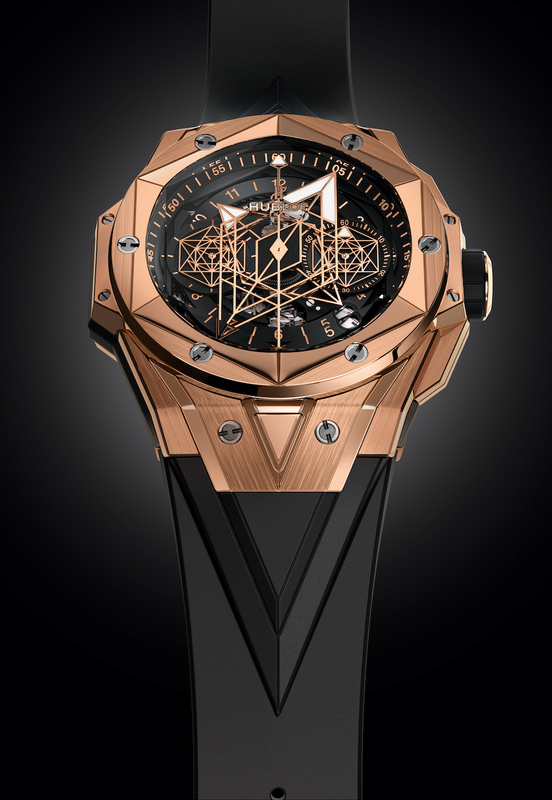 With “The Art of Fusion” as its tag line, Hublot regularly blends different worlds with the art of watchmaking. In this newest architecturally inspired piece, the dial motif created by Plescia-Buchi — a geometric mosaic — cuts into the case via a hexagonal bezel, and carves into the sapphire crystal. 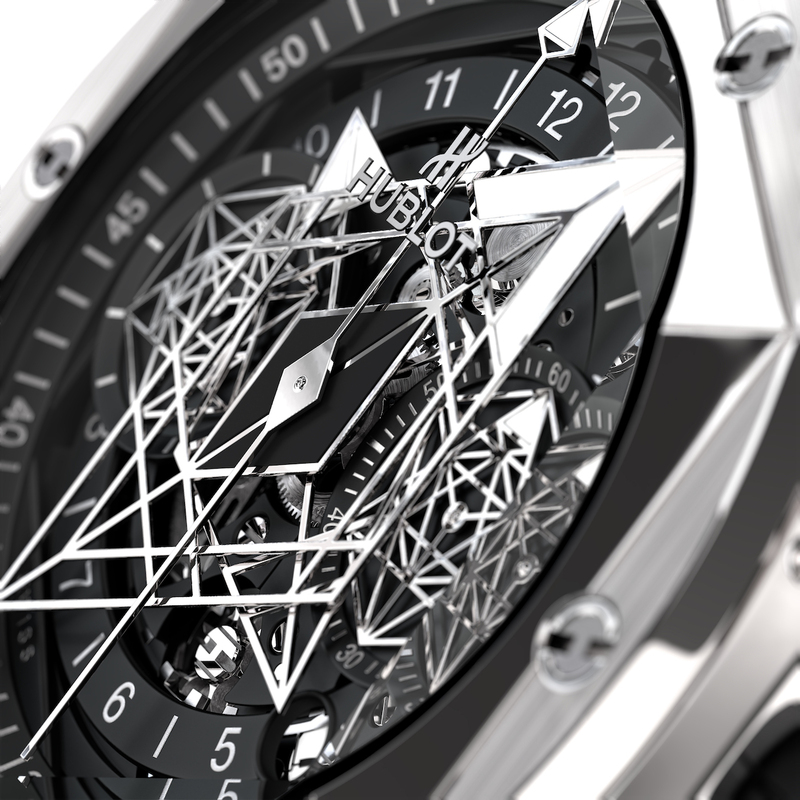 The matte black multi-dimensional dial features skeletonized hands. The 45mm Big Bang Sang Bleu II watch displays the chronograph central seconds along a straight hand, while the running seconds are in a sundial at 3 o’clock with an arrow tip for the indication. Similarly, the hour hand features an arrow tip, and the minutes are shown on a disk on the dial. 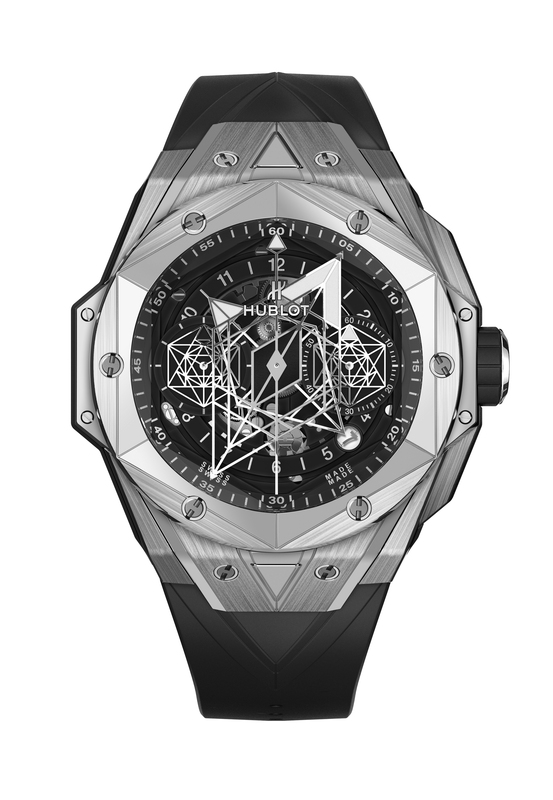 The Hublot Sang Bleu II watch is a case study in geometric angles and art. The watch is powered by the in-house-made self-winding HUB 1240 Unico movement that offers chronograph and 72 hours of power reserve. The column-wheel chronograph movement consists of 330 components and 38 jewels. It is water resistant to 100 meters. 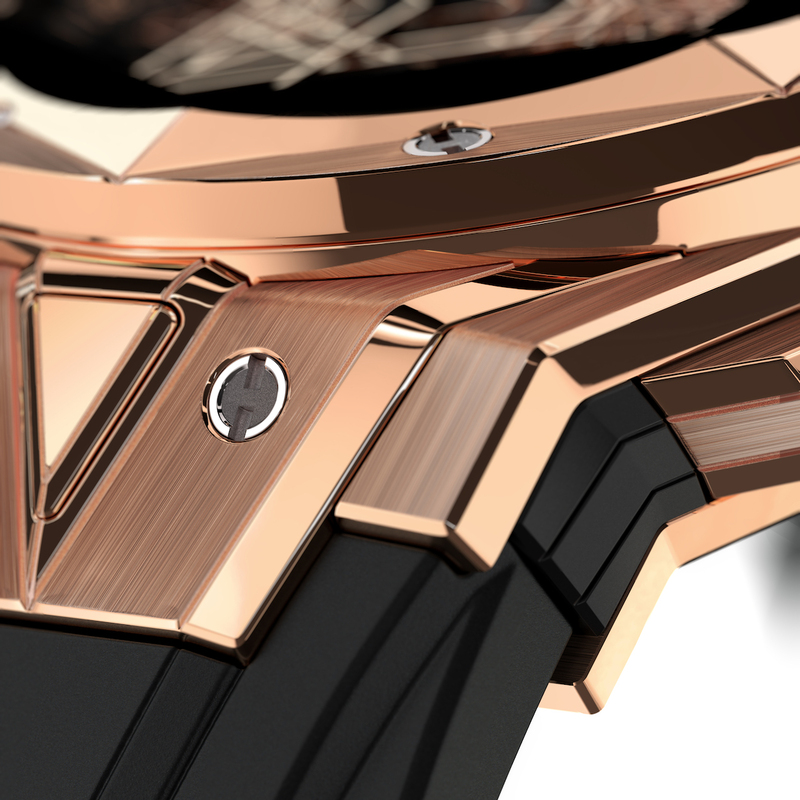 Just two versions are being made, one in polished and satin-finished titainum and one in Hublot’s proprietary King Gold. The case back of each is finished in the matching metal and has a hexagonal motif with hexagon screws. Exactly 100 pieces of each will be made. Each is sold with the brand’s interchangeable black rubber strap.